Hextech Revolution was the fifth Factions storyline, launched on March 31, 2014. It was preceded by Shon-Xan. The Void’s corruption has spread from Icathia to the ancient sands of the Shurima Desert, mingling with the mysterious enchantments that still haunt the ruins of that once-great civilization. Where these forces have met, explorers have discovered seams of dark purple sand. Abundant and charged with alien energies from beyond our dimension, this “dark sand” (pyrikhos in Shuriman) could fuel a techmaturgical revolution and transform all of Valoran. Piltover, Bandle City, Zaun, and Demacia each seek control over this powerful but dangerous new resource. The Council decrees that this dispute shall be resolved by the final adjudicator among nations: the League of Legends! This storyline ended on July 13. Zaun was ultimately victorious. Further lore updates are coming soon™. Click here for an overview of previous storylines. The “scoreboard” for this arc. Match results determine the balance of power, which shapes the course of the story. We’ve introduced a research system through which factions can decide which projects to pursue. 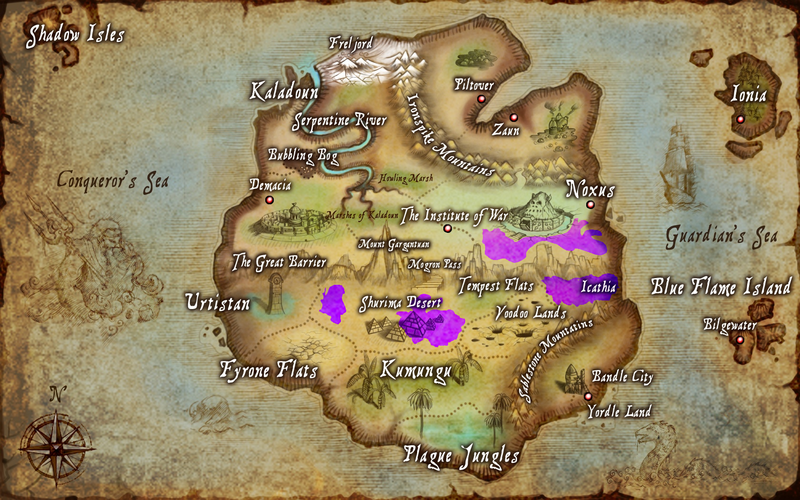 The spread of the Void’s contamination since the opening of the Icathian rift. This sets the stage, introduces the factions, and explains what they’re each fighting for. Update 1 — Trouble, Right Here In Bandle City! Summoners from each faction decide on a new Champion for their rosters, and make some other important decisions. Zaun bombs Piltover, pushing it and Bandle City closer together. Curious yordles break into ancient pyramid, and absolutely no merry sing-a-longs follow. Zac founds a Mutant Academy in Zaun. The Void invades Zaun when their research into Pharmakon II goes horribly wrong. An undead army rises in Shurima, staggering forth to attack Bandle City! This update launches the second interactive lore event of this arc. Nefara’s undead horde marches on Bandle City! Other factions must decide how to respond. How Jinx finally joined Zaun. Piltover selects a new Champion after winning a round of Featured Matches. Bandle City and Zaun have some decisions to make in the midst of the undead invasion. Nefara’s undead legions attack Bandle City. The other factions band together to mount a defense. The inaugural edition of the Summoner’s Herald covers the undead attack on Bandle City and the great tournament for Field 14. Merricurry comes to Zaun, and finds it a more frightening place than she anticipated. Demacia marches into Shurima at Ceruleana’s command to prevent a Void apocalypse, while Swain fights to put down Noxian rebels and regain control. Demacia attacks Zaun’s mines in Shurima, beginning the largest battle Valoran has seen since the Rune Wars. An edition of the Herald covering the end of the League dispute and the battle in Shurima. Demacia, Zaun, and their allies join in a desperate bid to close a Void rift that threatens to destroy Runeterra. Viktor and Merricurry fight their way into the mines to close the Void rift. The battle against the Void awakens ancient forces from a bygone age. Zaun is victorious. A faction-by-faction overview of the aftermath.